518 West Seneca Street is owned by a not for profit corporation called “Ithaca Community Recovery.” ICR was formed by a group of local people for the purpose of providing a meeting and activity space for Ithaca’s recovering community. Ithaca Community Recovery is a not-for-profit corporation serving as a community resource. We provide safe, affordable, drug/alcohol free meeting and event space for 12 Step and other recovery oriented groups, individuals and their families. We accomplish our mission by maintaining an involved Board of Directors and a solid management structure with the intention of functioning based on sound management practices, while sensitive to 12 Step principles. As a Board, we will maintain responsible financial and administrative practices including planning for capital improvements and future growth, funding maintenance projects, and providing resources to ensure the long range viability of Ithaca Community Recovery. 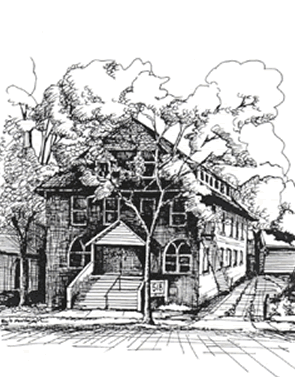 Since 1909 our home at 518 West Seneca Street has been an Ithaca landmark. Designed by architect William Henry Miller, the Children’s Home opened as an orphanage housing children until 1952. It then served a citywide congregation as the Assembly of God Church until 1999.